MD 940 · Owings Mills Blvd. 0.48 mi. ; from Dolfield Rd. east to MD 140. Marked east-west at east entrance on MD 140. Connects MD 140 and I-795 to the Owings Mills Town Center. Second highest signed number in Maryland, although only on guide signs on MD 140. MD 940D: Smoot La. 0.02 mi. ; from Church Rd. south to road end. Runs alongside the west side of I-795 near Franklin Blvd. MD 940S: (no name) 0.37 mi. ; from MD 30 west to road end. Just north of end of I-795 on MD 30. MD 940 marker on northbound 140, Owings Mills. MD 942 · Bridge St.
MD 942 is more important than the number implies. It's the bridge over the Potomac River in Cumberland, becoming WV 28 across the line. In the 1953 and earlier maps, this route was designated MD 764. 2 pieces, very far apart. Unmarked, associated with MD 143 & 243. 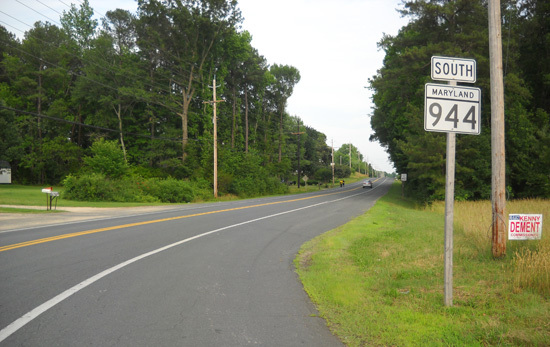 MD 943: Warren Rd. (BA) 0.59 mi. ; from I-83 exit 18 ramps east to Beaver Dam Rd. New ramps constructed in 1994. Number 943 chosen as original Warren Rd. to east of MD 45 was once MD 143. MD 943: Old MD 243 (SM) 0.19 mi. ; between MD 243 and MD 5. Just as the Baltimore Co. 943 is associated with 143, this one is associated with 243. 7 pieces along MD 235 between MD 4 and MD 245. One section marked east-west, associated with MD 235. MD 944: Mervell Dean Rd. 2.26 mi. ; from MD 235 south to end of state maintenance. Parallels MD 235 on eastern side. Probably part of the old 235. MD 944A: St. John's Rd. 0.18 mi. ; SHA maintained section straddles MD 235 on both sides. MD 944B: Sandy Bottom Rd. 0.02 mi. ; from MD 235 west to end of state maintenance. MD 944C: Clark's Landing Rd. 0.04 mi. ; between MD 235 and MD 944. Connects 944 with 235 near the main 944's south end. MD 944D: Airport View Rd. 0.06 mi. ; Straddles MD 235 both sides. MD 944E: Miles Village Rd. 0.02 mi. ; from MD 235 west to end of state maintenance. MD 944F: Airport Dr. 0.02 mi. ; from MD 235 west to end of state maintenance. 0.10 mi. ; near MD 235-245 junction. Unmarked, associated with MD 235. Parallels MD 235, dead end at both ends, served by spurs to 235 in between. MD 946 · Finzel Rd. 0.61 mi. ; from US 40 Alt. north to MD 546. Status: Marked north-south, associated with MD 546. A connector to the east of the current Alt 40-546 intersection. Unmarked, associated with former US 48, now I-68. 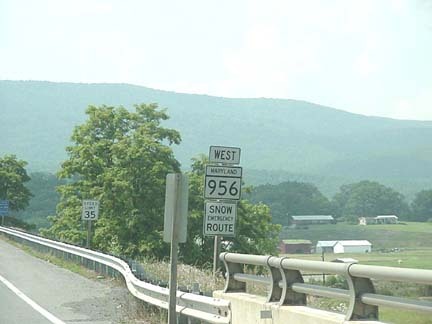 Along I-68, MD 948 comprises several sections in Allegany Co. east of Cumberland, and in central Garrett Co.
MD 948B: Old Frostburg Rd. (GA) 0.24 mi. ; across I-68 west of MD 546. MD 948C: (no name) (AL) 0.39 mi. ; from MD 144 north to road end. MD 948H: Diesel School Rd. (GA) 0.62 mi. ; from US 219 east to road end, just south of Alt US 40. MD 948K: (no name) (GA) 0.40 mi. ; from Pigs Ear Rd. west to road end. Parallels north side of I-68 3 miles west of US 219. MD 948L: (no name) (GA) 0.00 mi. ; from Pigs Ear Rd. west to road end. Parallels I-68 to the south. MD 948M: W. Wilson Rd. (AL) 0.44 mi. ; from MD 144 west to end of state maintenance. MD 948P: North Park Rd. (GA) 1.15 mi. ; from MD 495 east to road end. MD 948Y: High Germany Rd. (AL) 0.37 mi. ; from US 40 Scenic north to Washington County line. MD 948AD: Pleasant Valley Rd. (AL) 0.20 mi. ; from MD 144 north to end of state maintenance. Exit 50 on I-68. 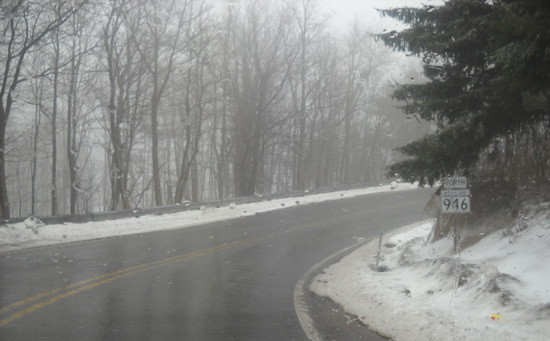 MD 948AE: Rocky Gap Rd. (AL) 0.18 mi. ; from MD 144 north to end of state maintenance. Bridge over I-68 and approach. MD 948AF: Jeffries Rd. (AL) 0.29 mi. ; straddles bridge over I-68. MD 948AL: M.V. Smith Rd. (AL) 0.49 mi. ; Yet another I-68 overpass. MD 948AM: Flintstone Rd. (AL) 0.61 mi. ; Exit 56 off I-68. MD 948AO: Black Valley Rd. (AL) 0.31 mi. ; from MD 144 north to MD 948AM. In the same area of I-68 Exit 56. MD 949 · W. Braddock Rd. 0.56 mi. ; from MD 658 north to road end. Unmarked, associated with MD 49. Part of the old MD 49, cut apart by I-68. MD 949A: (no name) 0.12 mi. ; from MD 53 east to road end. Unmarked, number comes from US 50. Sections of MD 950 consist of approaches to bridges over US 50. MD 950: Garden City Dr. 0.22 mi. ; northwest of New Carrollton Metro Station. MD 950A: Whitfield Chapel Rd. 0.28 mi. ; straddles US 50. MD 950C: Lottsford Vista Rd. 0.42 mi. ; straddles US 50. MD 950D: Church Rd. 0.34 mi. ; straddles US 50. MD 951 · Vine St.
Unmarked, associated with MD 53. MD 952 is the designation of the approaches to I-68 Exit 45 just east of Cumberland. MD 952: Hillcrest Dr. 0.31 mi. ; from I-68 exit 45 NW ramps, across I-68, then northeast to road end. MD 952A: (no name) 0.37 mi. ; southwest from MD 952 along I-68 south side. MD 953 · Glenn Dale Rd. 3.53 mi. ; from MD 193 north to dead end at North Lansdale St/Amtrak rail line. Prior to elimination of a railroad grade crossing in Glenn Dale, this route was marked MD 199. ...Md-953 is much newer than the 1950s. When I bought a house in Glenn Dale, the last two grade crossings between DC and New York were in Glenn Dale---Hillmeade Rd and Glenn Dale Rd, which was Md-193. Only when the road was re-routed as Glenn Dale Boulevard and connected to Enterprise Rd, did the Md-953 come about. And Enterprise became 193 as well. MD 953A: Glenn Dale Rd. 0.15 mi. ; from Duvall St. north across MD 564 to road end. 3 sections; near north approach of US 50 Choptank River Bridge. MD 954A: Marina Dr 0.19 mi. ; from US 50 looping west then south to road end at marina entrance. MD 954B: Ferry Point Rd 0.05 mi. ; west off Marina Dr to end of state maintenance. MD 954C: (no name) 0.02 mi. ; cul-de-sac near marina entrance. 0.53 mi. ; from US 220 east to WV line. 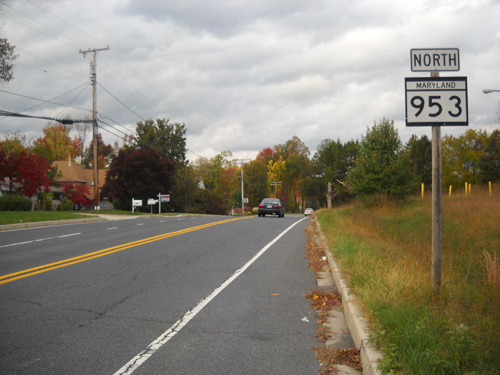 MD 956 is currently the highest signed route number in Maryland. It is small link from US 220 to a matching WV 956. More photos can be found on this 956 page on the West Virginia highway ends site. MD 957 · was Old Waterloo Rd. No longer assigned (decommissioned 199x). From 1985 Champion wall map. MD 957 is the old MD 175. MD 958 · Crestmount Rd. 0.21 mi. ; from US 1 north to road end. MD 958: Elibank Rd. east off Montgomery Rd. (old MD 103) parallel to north side of I-95. MD 958: Mission Rd. part of road parallel to south side of I-95.